Phone Cleaner for Media Files is a utility that allows you to quickly clean up storage space on your iPhone or iPad. 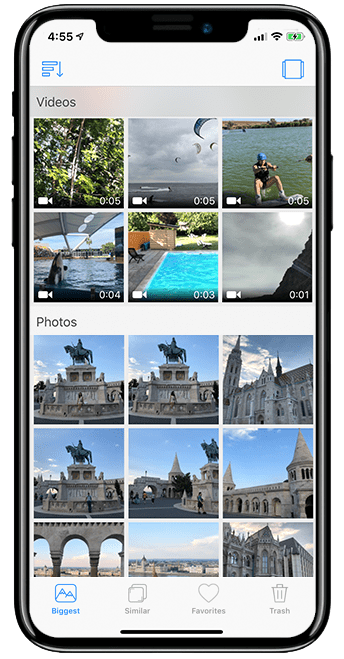 The application finds the bulkiest photos and videos, useless similar photos, and even duplicate media files that you may have already backed up on your Mac. 1. How to get started with Phone Cleaner for Media Files. 2. How to find the largest photos and videos on your iPhone. 3. 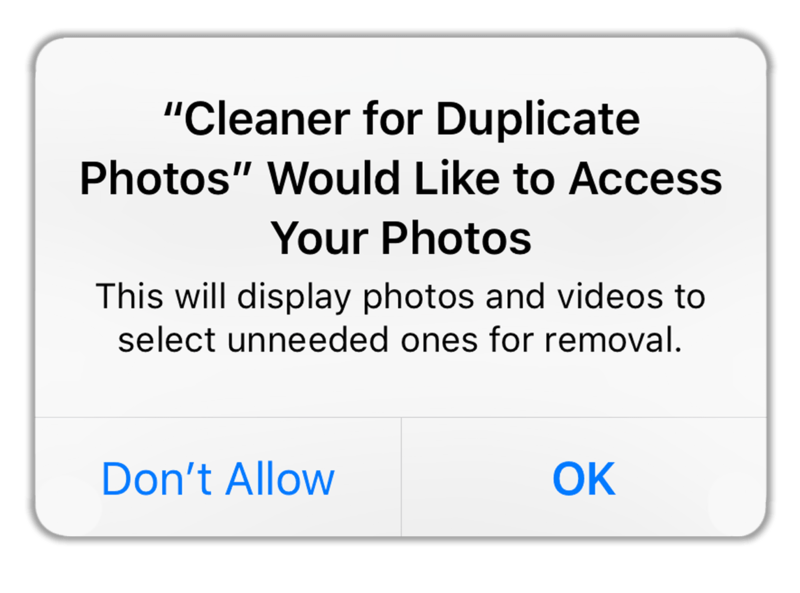 How to find and remove duplicate photos on your iPhone. 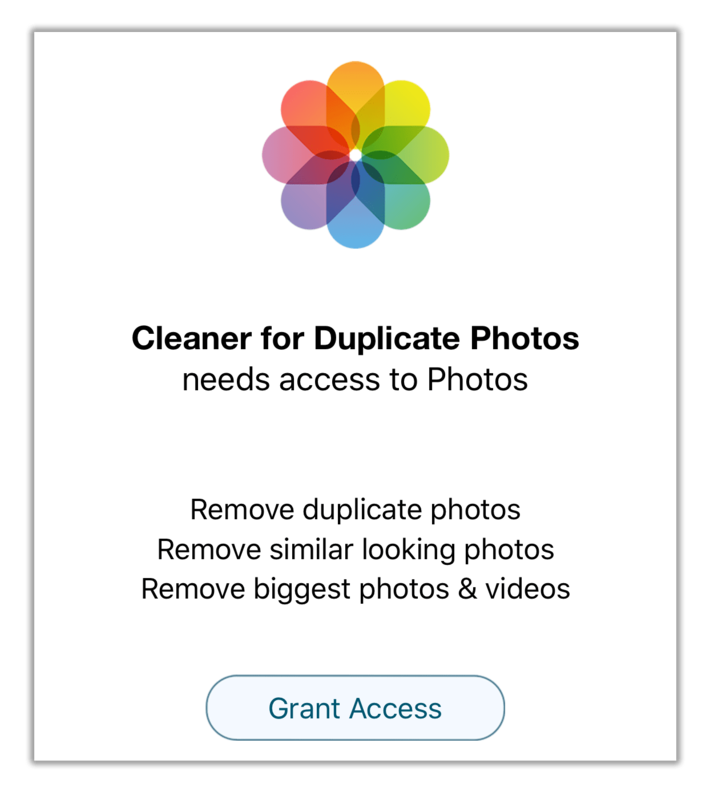 Upon launching Phone Cleaner for Media Files for the first time on your iPhone, the application will ask for access to your Photos. Tap OK. If for some reason you selected “Don’t Allow,” you can grant access at system settings. Launch Phone Cleaner for Media Files, and then go to the “Biggest” section. 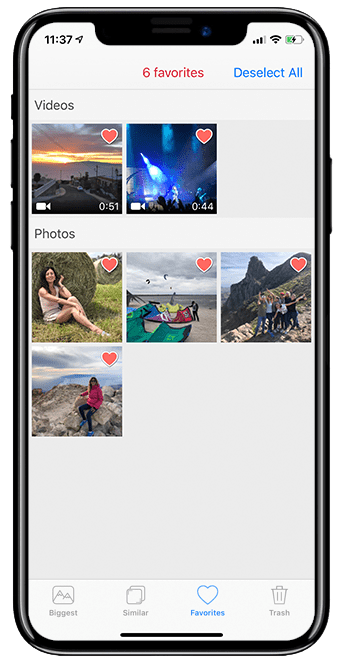 Here you will find the photos and videos that take up the most space. They are shown in descending order according to size. Preview them and remove unneeded, bulky files to the Trash. For your convenience, Phone Cleaner for Media Files can display files in the “Biggest” section as a list sorted by either size or date. Use the appropriate icon in the top-left corner to sort files as you wish. To switch the preview mode between the Coverflow and List displays, tap the square icon in the top right corner. Preview your media files, then just tap on unneeded ones and they will automatically be moved to the Trash. To permanently delete them, you can go to the Trash or just press the “Remove Selected” button. 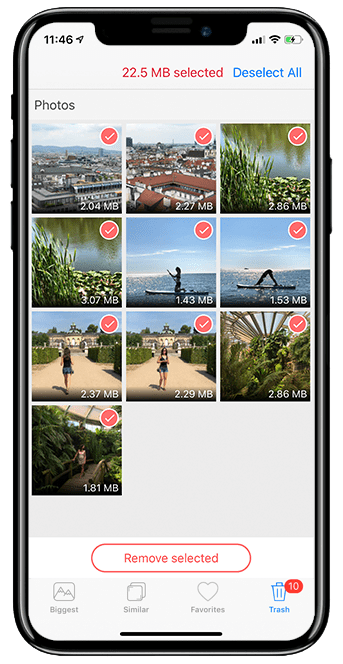 Having thousands of similar shots in your iPhone storage may be painful when you need to clean up your files. But with this phone cleaner, this task will be much easier than you think. 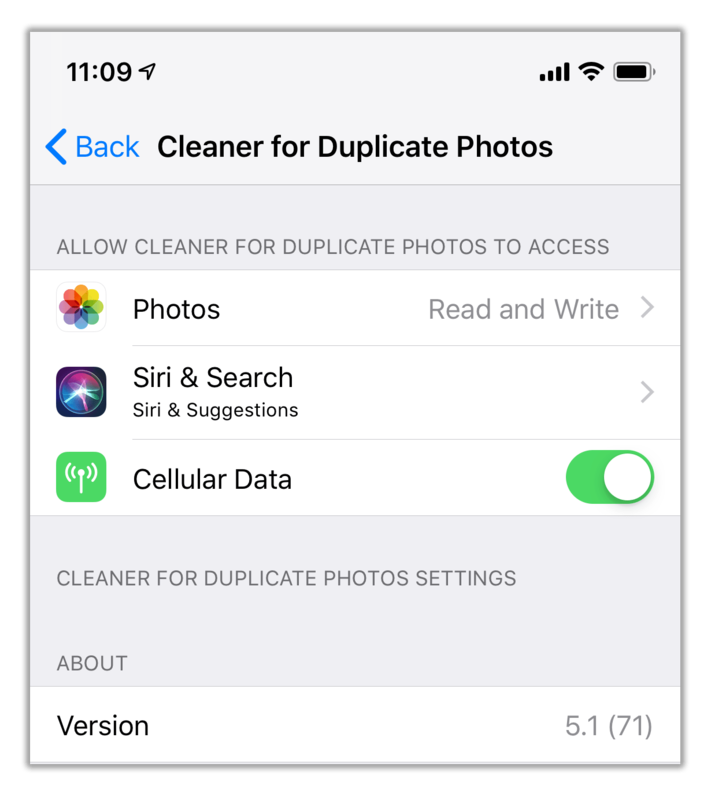 To quickly find and remove similar pictures on your iPhone, switch to the “Similar” section in Phone Cleaner for Media Files. Here you will find photos grouped by similarity, which look like duplicates. Scroll down to view the next set of similar photos. Press the “Trash” button to remove a file to the Trash. 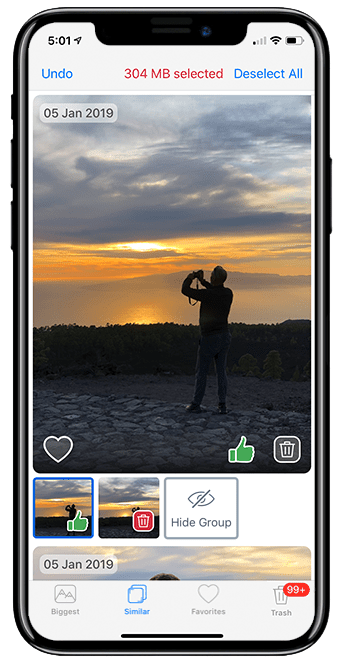 Press the “Thumbs up” button to keep the photo and remove all other files from the group to the Trash. Press the “Heart” button to add a photo to Favorites. Press “Hide” to exclude the group of similar photos from displaying. Press “Undo” in the top-left corner to undo the last action. Press “Autoselect” to allow the phone cleaner to automatically select copies and move them to Trash. One photo will be kept in each group. Swipe left/right to navigate the files in each group. Tap on the big photo in each group to preview it in full size. When you finish selecting unneeded similar photos, switch to the Trash section and remove these files. Once again, we would like to remind you that if you wish to protect files from being removed by mistake, you can add them to Favorites. In this case, the files will neither be displayed in the “Biggest” section nor in the “Similar” section. Adding files to favorites or hiding groups of similar photos will help you to concentrate on the media files you don’t need and want to remove. In the Trash section, you can view all the files selected for removal. If you change your mind about some pictures or videos, you can easily deselect them. If you don’t want to delete any of these files, use the “Deselect All” option. Important note: all removed files go to the Recently Deleted folder in the Photos app. 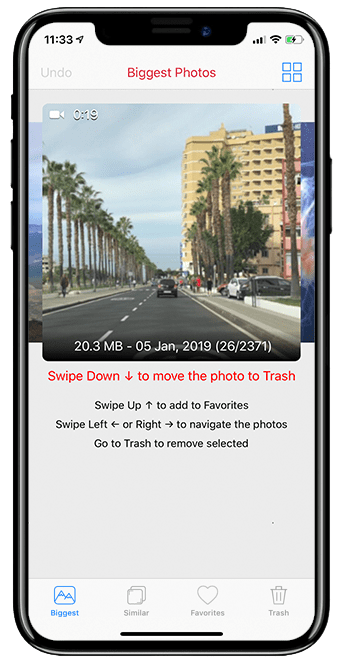 You can recover files from there if needed, but in order to complete the process and free up storage space, be sure to empty your iPhone’s Trash.